Matt's Bike Blog: Is This A Pie I See Before Me...? Successful athletes talk about the importance of visualisation - imagining yourself at the moment of triumph, such as crossing the finishing line or on the winner's podium. Apparently it gets you through the tough stuff. 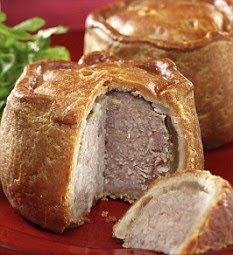 Picture This - Yum, a Pork Pie! Just to explain - after the last few weeks' exertions, I thought I'd give myself a lighter ride this weekend. And as the wind this Saturday is, unusually, forecast to come from the East (well ENE) I'm going to head that way, which means Leicester. It's not a direction I regularly head in, so something of a voyage of discovery. I've scheduled an 80-mile ride, on a route which is bumpy without being too hilly. But if I can get off early and the ride is going well (and that is a big if), I could push on an extra few miles...to the home of pork pies (and Stilton cheese), Melton Mowbray! After all, if you're using a few thousand calories up, a pork pie is hardly going to touch the sides (although it will probably just sit in my stomach, undigested, like a brick). But you need your targets - I find the idea of a pint of lager works equally well. Is this how Lance does it, I wonder?